I got the catalog of EASTMAN titled “Resin Solubility Chart”. It lists Resigns and their viscosity with many solvents. These examples become very good learning materials to determine HSP of resign and search solvents mixture. When I determine HSP of polymer, I need the information of good solvent or bad solvent (Qualitative analysis case), and for Quantitative analysis case I need real solubility (g/100cc) or intrinsic viscosity. 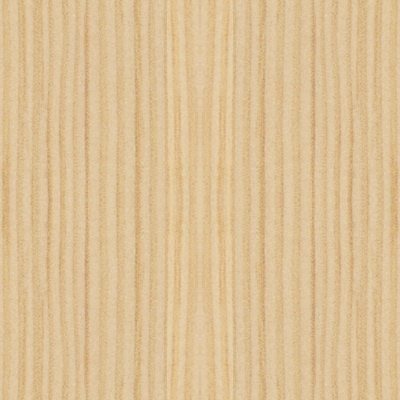 In the catalog, you will see the table like below. Red marked resigns or solvents are EASTMAN product. The first thing you have to do is make table. 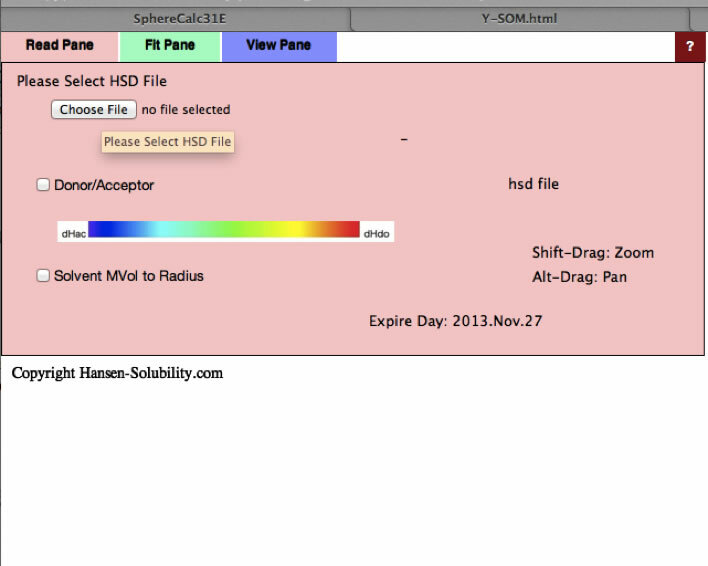 For your convenient, I give you Solvent’s HCode (Hansen Code) and CAS number table. 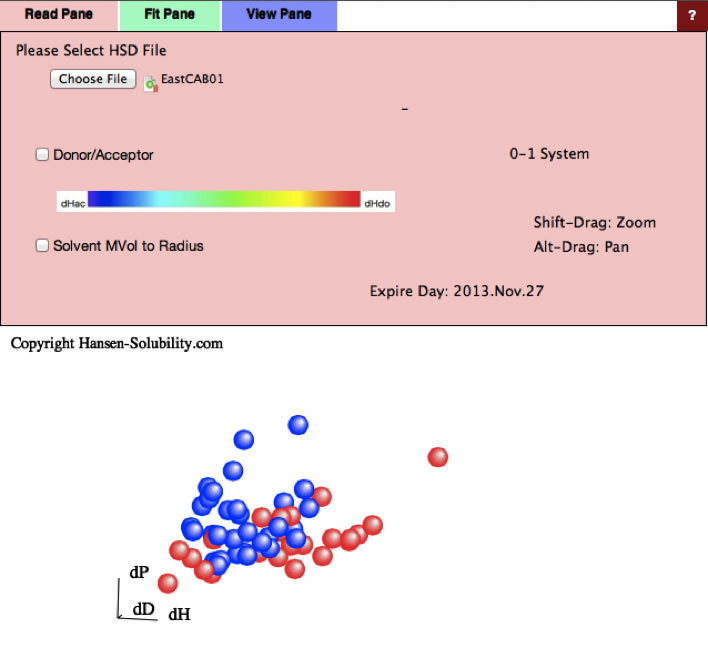 To make .hsd (Hansen Solubility Data) format file, you can use HSPiP software or Spreadsheet software. It is depend on you. 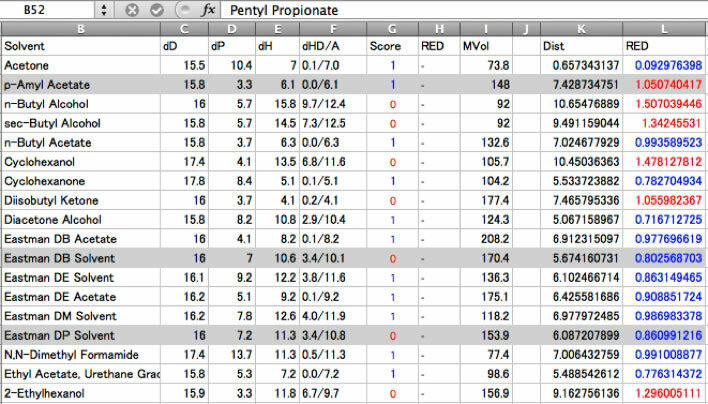 To handle Score values, Spreadsheet is much easier. But set up HSP value, HSPiP is much easier. I will explain my ordinal procedure. 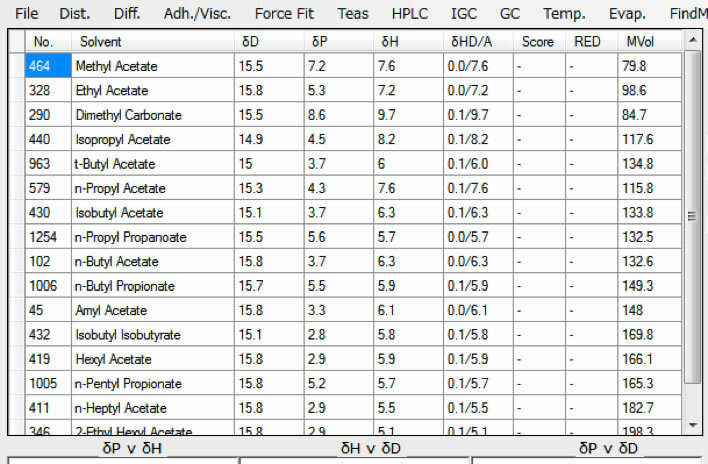 At first, you need to make the Solvent with HSP value table. Choose the File/New menu. It make blank table. Then set HCode at search text field and click search button (binocular mark). And double-click at the left edge box of the line. Then information is copy to main table. Set all the solvents’ information. After table is done, save (FILE/SAVE) the table with Test.hsd format. You can open this Test.hsd file with text editor or Spreadsheet. 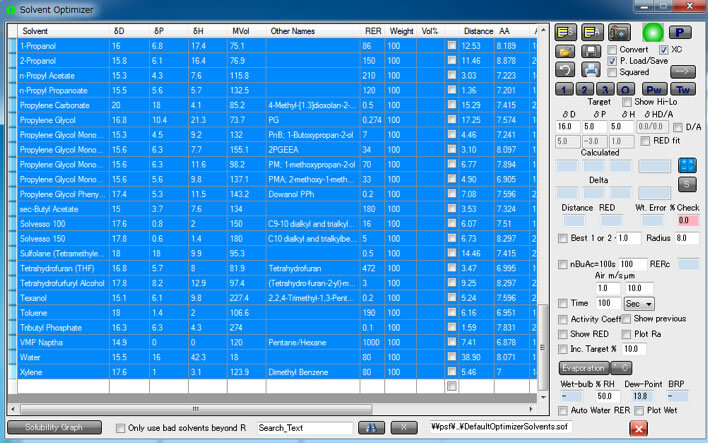 Then you need add viscosity data AFTER MVol column. In this catalog, many polymers’ viscosities are listed but solvents’ rows are identical, so Spreadsheet is much easier to use. Sometime we want to handle viscosity data as bit 0-1, sometime want take logarithm of viscosity, sometime divided by maximum viscosity, such handling is also much easier with Spreadsheet. The point is that do not change A –F, H-I column. Just set Score values and copy A to I column to text editor then save Test01.hsd, then HSPiP or power tool can read that file. For example, Eastman T CAB-381-0.5 8wt% case, you add the viscosity column and fill the values. Then set Score. For example, Classic input is 0 for bad solvent, 1 for good slvent. So 0 for I (Insoluble) solvent, and 1 for others. Then run HSPiP or Power Tool F-Fit. If you run the F-Fit, you will see the initial window like below. Then click Choose file button and select EastCAB01.hsd. If you fail to load file, please check Line Feed (LF) of file. The standard LF character for browser is UNIX type of LF and old Mac LF(\r) will not accepted. Then, at Fit Pane, please click Fit button. After Y-Fit search the sphere, pane is automatically changed to View Pane. And if you checked the sphere1, you will see the green large sphere that show the Eastman T CAB-381-0.5. So the HSP of CAB is [15.37, 10.67, 6.46] and Radius of sphere is 7.07. If you are using Y-Fit, you need to calculate Distance and RED by hand. And you will see which solvents are became exception. Some solvents become wrong in (RED<1.0 but insoluble). The reason is that HSP are good match but molecular size is large and can’t penetrate into polymer. Some solvents become wrong out (RED>1.0 but dissolve). Small solvents are easily penetrated into polymer even HSP are not so match. 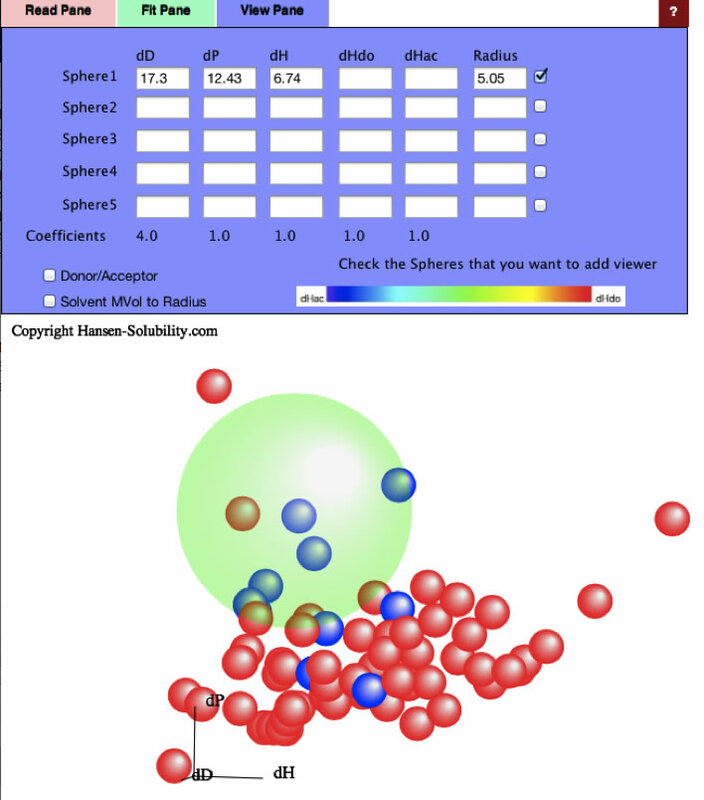 Once you get HSP of polymer and Radius of Sphere, you can design of mixture of solvents. The solvents listed in this catalog are so-called Green Solvents. They have only Alcohol, Ester, Ketone and Ether functional groups. They are safety for human being and suitable for environment. But sometime, solubility is lacking for some specific polymer. In that case, we need to find solvent mixture that dissolve polymer. Before start solvents design, it is good idea to understand how to make “Solvent Optimizer Format” file. You can make your own sof file. 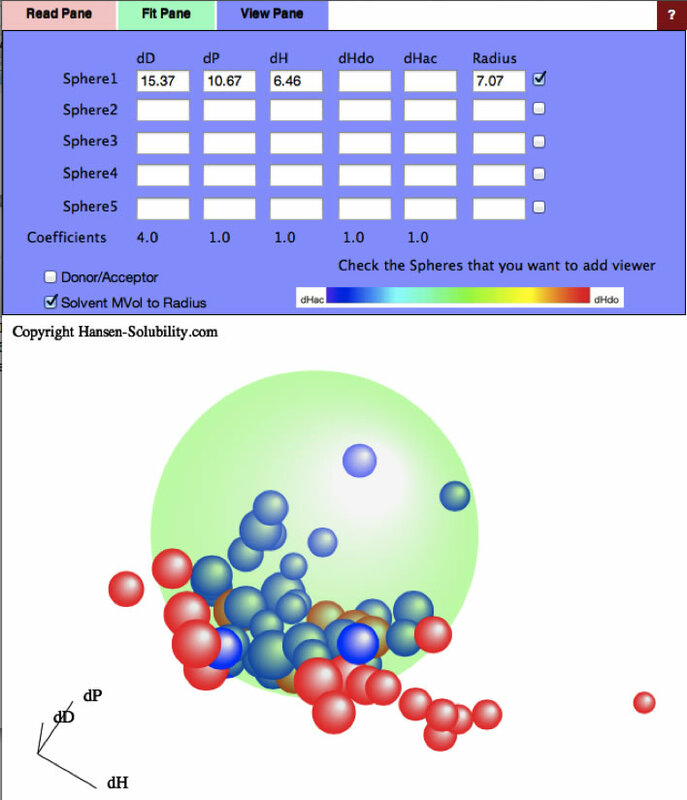 As default, DefaultOptimizerSolvents.sof is set to Solvent Optimizer Panel. Delete (not Back Space key). Back to main panel and show all solvents list. Then right click at the left rectangle of solvent line. The confirm window appear. Then the solvent will add to Solvent Optimizer table. After you add all solvents, click save button (Floppy mark). The Eastman T CAB-381-0.5, HSP are determined as [15.37, 10.67, 6.46]. 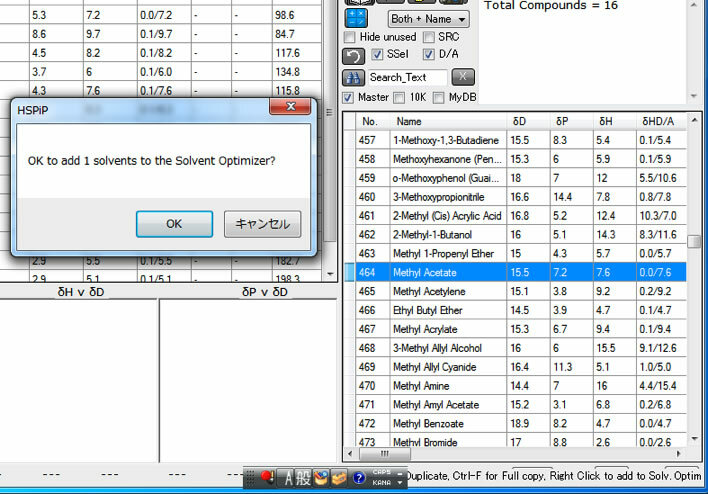 Enter these values to Solvent Optimizer Target. Then distances from each solvent of Eastman.sof are calculated. If you click Distance column, solvents are sorted increasing (decreasing) order. As single solvent, Acetone is the best solvent. If you click 2 marked button, program search binary mixture of solvents. In this case, DMF and t-butyl acetate 50:50 mixture is selected. For example, if you do not want to use DMF, Ctrl-Click left rectangle of solvent line, the line is marked grey and will not use for further research. In Eastman catalog, Cellulose Acetate (EastmanT CA-398-3 10Wt%) solubility data is also listed. But Cellulose Acetate is much poor solubility to these green solvents. And solvents diversity is so limited and Y-Fit result [17.3, 12.43, 6.74] Radius 5.05 is not reliable. 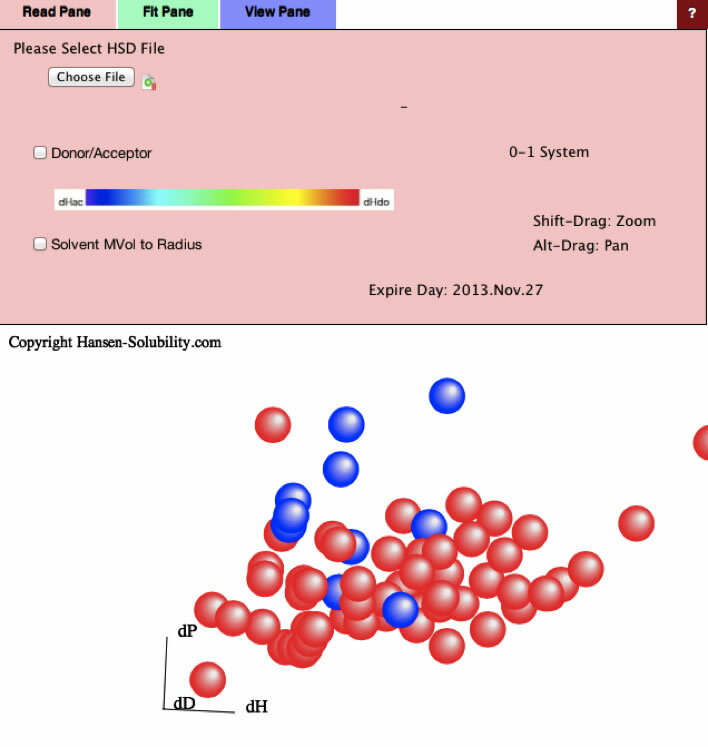 I compiled solubility data from Polymer Handbook and other sources. 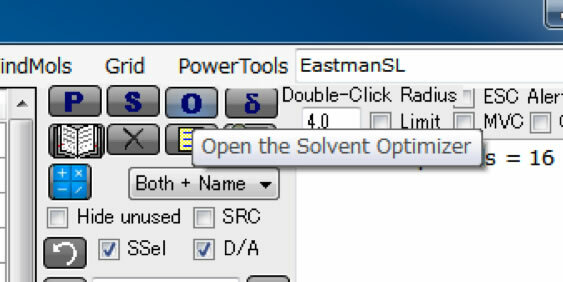 Then put these values for Solvent Optimizer with Eastman.sof file. The minimum single solvent is NMP and distance is 4.72. As green solvent, propylene glycol monophenyl ether has minimum distance 7.23. Isophorone and propylene glycol monophenyl ether 58:42 is the best binary green solvent. In the Eastman Catalog, they list the viscosity data. If these viscosity data are intrinsic viscosity, we can apply “REAL” analysis with Y-Fit. But with just viscosity, the result is not so reliable.